It's been 11 years since An Inconvenient Truth, which won the Oscar for Best Documentary, gave us the Al Gore slide show and saw the former Vice President of the US go from a voice in the wilderness to the Big Daddy of global environmentalism. Fast forward, and Gore – who is a great communicator and can present scientific, technological and geopolitical information in an accessible and engaging way – has trained tens of thousands of climate activists around the world and worked tirelessly for the answers to the questions posed in the original film. For this sequel, co-directors Bonni Cohen and Jon Shenk accompanied Gore on the globe-trotting work that helped bring about the Paris Agreement, giving us a warm, entertaining, fly-on-the-wall portrait of the man. 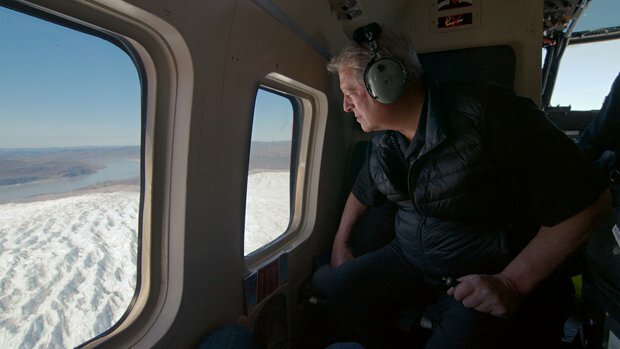 Here is Gore sinking into a melting glacier in Greenland, there is Gore comforting typhoon survivors in the Philippines, wading through a flooded downtown Miami, or chatting with commuters on the Paris Metro en route to an event. Everywhere he is on the phone or in meetings with politicians, captains of industry and world bankers to enlist their help in the sustainable revolution. He is a charming and savvy negotiator, using calm reason to win over unlikely allies (there is a brilliant sequence of Gore laughing it up with a conservative Republican mayor of a town in deep red Texas, where they have switched to 100% renewable energy because, duh, it's cheap and clean). At rallies, in seminars and in one-on-ones with ordinary individuals he emerges as empathetic and passionate. There is shocking footage of extreme weather events to induce gasps: people sticking to a melting road in a sizzling heatwave, a drowning woman being rescued from a flash flood, fish swimming along a high street. There are very moving moments and many of hilarity; Gore is a funny guy and now that he's not seeking political office he is free to say what he really thinks. As to the big topic at hand, namely saving the planet, it's a good news / bad news story in which a message of hope shines through this inspiring call for people to exercise their power. Eleven years after the original film, this is a fly-on-the-wall portrait of the Big Daddy of global environmentalism going about his work. Gore comes across as a charming and savvy negotiator, funny, empathetic and passionate. An inspiring call to people to exercise their power. Please please people of the world don't listen to idiots like Trump do something now to stop destroying our planet..We only have one!